Note: This unabridged audiobook download is narrated by Chris Hogan and runs 9 hours and 25 minutes. Chris Hogan has done the impossible—written a book on investing for retirement without losing his audience in a fog of boring jargon. He explains the concepts using concrete and practical examples, and he shows how everyone can enjoy a great retirement, not just the wizards of Wall Street. No matter where you are on the retirement journey, this book could drastically improve your future. Too many people are bringing debt and regret into their retirement years. That's a tragedy that could—and should—be avoided. Retire Inspired can show anyone, at any age and any income, the steps to achieve their retirement dreams. Here's what Chris Hogan gets about retirement that other people miss: your wishes will remain wishes until you put a plan in place to attack them. Hogan learned from his mentor Dave Ramsey how to do just that. In this book, he passes that wisdom on to you. This book not only provides useful information on retirement, but it also tackles subjects that all of us need to address as we near that stage of life, like estate planning, living trusts, changing your investment portfolio, and talking to your aging parents about money. This is simply the best book for anyone who wants to make the most of their retirement years. As president of my own firm and a financial professional, I truly believe this is the only book you should consider as your guide to retirement. 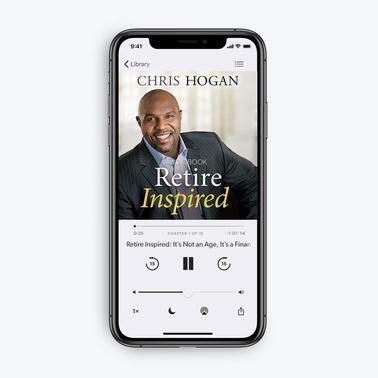 Chris Hogan takes Dave Ramsey's timeless wisdom on money and digs further into the specifics of retiring well and leaving a legacy. He guides you step-by-step in how to comfortably and confidently make the enormous life transition into retirement. This book is a gold mine of resources and advice that I would recommend to anyone!